Another great champion has lost his bout. Smokin' Joe Frazier died last Monday night from complications from liver cancer in a Philadelphia hospice as confirmed by his family. Smokin' Joe was 67 years young. Frazier will always be remembered for his epic fights against Muhammad Ali especially the Thrilla in Manila. Rest in Peace Champ! 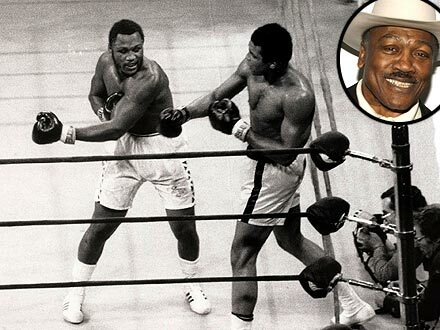 Joe Frazier, the former world heavyweight boxing champion, died after a battle with liver cancer. He was 67. Frazier, whose death was confirmed Monday by his family, had been in a Philadelphia-area hospice. Known for his famous "Thrilla in Manila" fight in 1975 against Muhammad Ali, whom he fought three times, "Smokin' Joe" Frazier is an inductee of both the International Boxing Hall of Fame and the World Boxing Hall of Fame. In all, Frazier – at 5'11½ and 205 lbs., considered small for a heavywieght – won 32 fights: 27 by knockouts, losing four times (twice to Ali and also to George Foreman). Another fight ended in a draw. When news first broke of Frazier's cancer battle, Ali, 69, sent public prayers and well-wishes, saying, "The news about Joe is hard to believe and even harder to accept."